Fewer than 12 hours after Santa-suited revelers sweep Las Olas Boulevard during the annual Santacon bar crawl, even more jolly folks in red will descend upon Fort Lauderdale in a much healthier, and probably sweatier, endeavor. The inaugural Fort Lauderdale Jingle Bell Jog will take place Sunday morning on Las Olas Boulevard. And if you think few people are willing to encumber themselves in a Santa costume and beard, know that the race reached its 2,000-runner capacity a week ago. In an act of holiday overkill, Stern also is providing all participants two jingle bells to wear on their shoes, so people eating breakfast at the Floridian, for example, will be serenaded. Also, the Girl Choir of South Florida will be strategically placed along the route, which starts at Huizenga Park and turns around at Royal Palm Drive. 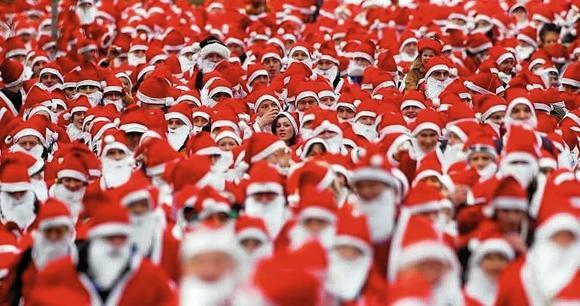 The race is a copy of events in Colorado and Scotland, called Santa Stampedes, which each draw about 10,000 Santas in full costume. A good 5K in South Florida draws about 1,000 people, but Stern says he’ll eventually shoot for 10,000, as well. Read more about this event in the Sun Sentinel!